If any of you have ever been to a military funeral in which taps was played; this brings out a new meaning of it. We in the United States have all heard the haunting song, ‘Taps…’ It’s the song that gives us the lump in our throats and usually tears in our eyes. Reportedly, it all began in 1862 during the Civil War, when Union Army Captain Robert Elli was with his men near Harrison’s Landing in Virginia . The Confederate Army was on the other side of the narrow strip of land. During the night, Captain Elli heard the moans of a soldier who lay severely wounded on the field. Not knowing if it was a Union or Confederate soldier, the Captain decided to risk his life and bring the stricken man back for medical attention. Crawling on his stomach through the gunfire, the Captain reached the stricken soldier and began pulling him toward his encampment.. The Captain lit a lantern and suddenly caught his breath and went numb with shock. In the dim light, he saw the face of the soldier. It was his own son. The boy had been studying music in the South when the war broke out.. Without telling his father, the boy enlisted in the Confederate Army. The Captain chose a bugler. He asked the bugler to play a series of musical notes he had found on a piece of paper in the pocket of the dead youth’s uniform. 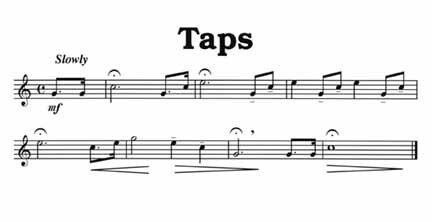 The haunting melody, we now know as ‘Taps’ used at military funerals was born. The words are: Day is done. Gone the sun. From the lakes From the hills. From the sky. All is well. Safely rest. God is nigh. Fading light. Dims the sight. And a star. Gems the sky. Gleaming bright. From afar.. Drawing nigh. Falls the night. Thanks and praise. For our days. Neath the sun. Neath the stars. As we go. This we know. I too have felt the chills while listening to ‘Taps’ but I have never seen all the words to the song until now. I didn’t even know there was more than one verse . I also never knew the story behind the song and I didn’t know if you had either so I thought I’d pass it along. This entry was posted in HISTORY CHANNELS, THE PRICE FOR FREEDOM and tagged Civil War, history of "Taps", military salute, Taps. Bookmark the permalink.